Jaguars and cheetahs don't inhabit the same areas, but they have one important thing in common. Both are considered endangered in their native habitats. For the jaguar, that's parts of North and South America, while for the cheetah it's sub-Saharan Africa. Hunting and development have fragmented the home ranges of these big cats. In the world of big cats, only the lion and tiger are larger than the jaguar. While jaguars resemble another large feline—the leopard—their coat pattern differs. While both have a light brown, orange-hued base coat and black spots, the jaguar spots are actually rosettes. These consist of black circles on the coat with a black spot in the center. Solid black jaguars also exist. Full-grown jaguars weigh between 70 and 250 pounds, the males being larger than females. Their body length at maturity is just under 6 feet, in addition to their 2- to 3-foot-long tails. Much smaller than the jaguar, cheetahs sport a tan base coat with black spots throughout. For a large cat, cheetahs have relatively small heads, with ears to match. Cheetahs have dark stripes on their faces, running from the inner eye corners to the sides of the nose, resembling tears. Males are larger than females and can also be distinguished by a sort of mane on their shoulders. 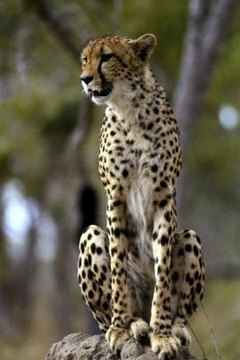 At maturity, cheetahs weigh between 75 and 150 pounds, with a body length of 3.5 to 4.5 feet. Their tail length is slightly less than the jaguar's. Jaguars make their homes in various habitats, including dense woodlands, swamps, grasslands and rain forests. They live and hunt on their own, making an exception when breeding season arrives. A typical jaguar's territory encompasses about 30 square miles, although males often have a larger home range. Cheetahs live in savannas, the same habitat as their grazing prey species. While female cheetahs live by themselves, except when raising cubs, male cheetahs often live and hunt with their male siblings. Jaguars hunt primarily on the ground, although they sometimes attack prey from trees. Jaguars enjoy water, along with hunting for fish. Their diet consists mainly of deer, crocodiles, tapirs, turtles and monkeys. Since cheetahs are the world's fastest land animal, they easily run down even the quickest large prey animals. Most of their food comes from hoofed species, such as impalas and gazelles. They also eat the calves of larger animals, such as the wildebeest, along with smaller game. Their chases last a minute or less, with an approximate 50 percent success rate.